Benefit from our analysis of 2 million online mentions and over 4.5 million interactions. Featuring some of the most innovative marketing experts who are responsible for changing the face of the industry. Over an 11 week period, we collected approximately 2 million mentions with a combined social media reach of over 3 billion. These numbers let us see which Influencers were most successful at engaging their audiences. Looking at the actions behind them showed us how they did it. We’re sharing all the data above, including a peak at the best tools, tips, and tricks to engage your audience inside a handy PDF. Our Top 5 Marketing Influencers may have different fields of expertise, but they are all pros at locating, engaging, and captivating their online audiences. Just check out their numbers. The most mentioned man in our ranking, Gary started with his family wine business and grew it from a $3M to a $60M business in five years. He now runs digital agency VaynerMedia. Along the way, he also added prolific angel investor and venture capitalist to his repertoire, investing in companies like Facebook, Twitter, Tumblr, Uber, and Birchbox. Tim is an early-stage tech investor and advisor in Uber, Facebook, and Shopify. Author of four #1 New York Times and Wall Street Journal bestsellers, including The 4-Hour Workweek and his latest, Tools of Titans: The Tactics, Routines, and Habits of Billionaires, Icons, and World-Class Performers. The Observer called Tim the "Oprah of audio" due to the widespread influence of The Tim Ferriss Show podcast. Michael is a New York Times bestselling author. As a publisher, former literary agent, and popular blogger, he has a unique perspective on the rapidly changing world of content creation and delivery. Host of This is Your Life podcast. Best-selling author, social media, and content marketing keynote speaker. Ann is the Chief Content Officer at MarketingProfs and columnist for Entrepreneur magazine. She has an exceptional talent when it comes to social media, business, and digital marketing. Joel has topped the charts as NYT bestselling author 12 times. He is a motivational speaker, entrepreneur, and consultant with more than twenty years of business experience. Joel is also widely considered to be a live video marketing expert and social media Influencer. Wanna find out who the top marketing Influencers on the web are? 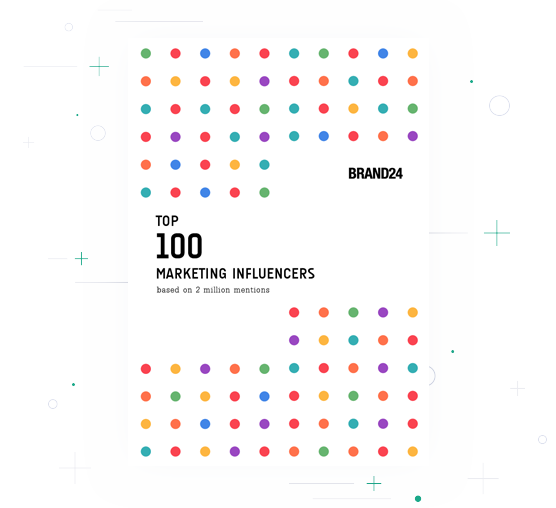 Tell us who your top influencers are by contacting our Global Community Manager at: magda@brand24.com or @brand24 on Twitter.